1. Look where you want to go. In fact, look way down the road. DO NOT look at the front of the bike while you are learning. Looking ahead will help your brain understand where you plan to go. Looking at the stem, your passenger, or front wheel, will make it harder to go in a straight line. 2. Bikes are more stable at speed. 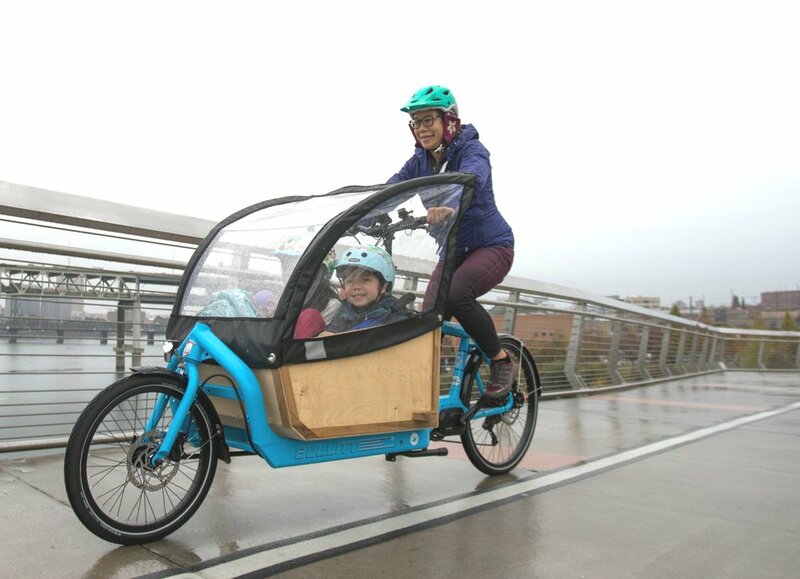 When first-time riders get on the Bullitt and feel the wobbliness, their tendency is to go slower but that's counterproductive. All bikes are more stable at speed, including the Bullitt. So, rather than brake when you first pedal off and feel that wobble, try pedaling more. Getting the bike up to 5-8 miles per hour will make the bike feel more stable. 3. Balance with your core. Another tendency of first-time riders is to try and correct the wobbliness by turning the handlebars - usually over-correcting and resulting in getting more unstable. That doesn't work on your other bikes and it definitely doesn't work on a Bullitt. Just like your other bike, you will want to balance the bike using your core. Center your weight over your hips and seat, relax, recall tips #1 and #2, then pedal off. If the bike swerves, follow it, pedal into it, get up to speed, then steer gently in the direction you want to go. Note: For the first ride, you may want to lower your saddle so your feet reach the pavement while you're seated on the bike. 4. And don’t forget to relax! Tense muscles make it harder to steer and add to the unsteady feeling. Take a deep breath, take a light hold of the bars, and follow steps #1- #3. Once you get to know the bike, it will be easy to ride. Expect to be able to stand up and pedal, signal, and generally ride without swerving. Be patient while your brain lags behind your desire, you'll get it and once you do, riding the Bullitt is as easy as riding a bike. In fact, we'd describe the Bullitt as very stable, nimble, predictable, and fun to ride thanks to the torsionally rigid frame and geometry.